Getting all the components of a Thanksgiving Feast to the table perfectly cooked and hot - not to mentioned beautifully carved - is a major feat and making gravy at the last minute could be the straw that .....you know. So why not make the gravy a few days or even a week or two ahead. Preheat oven to 400º. Melt butter in a medium roasting pan over medium-high heat. Pat turkey dry and add to roasting pan with vegetables. Cook turkey 3 to 4 minutes on each side and stir vegetables often. Bake in oven for about 90 minutes or until turkey is well browned. 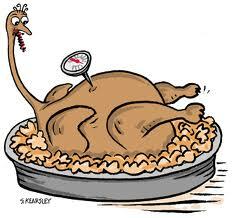 Remove from oven and discard vegetables and turkey - reserving turkey for another use if you desire. Whisk flour into hot drippings in pan and cook over medium heat, whisking constantly for a minute or two. Gradually whisk in chicken broth until smooth. Whisk in pepper. Bring to a boil over medium-high heat, whisking occasionally. Reduce heat to medium and simmer, whisking occasionally, for about 45 minutes or until thick enough to coat the back of a spoon. Salt to taste. Cool gravy, cover and chill up to 3 days or freeze for up to 4 weeks. One less thing to do on the Big Day!